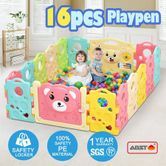 ABST 16 Sided Panel Baby Playpen-Run bear can really do you a big favor! For parents, it's not easy to keep a watchful eye on your baby every single time. When you are cooking, reading or doing housework, you are still worried about the baby. With our Baby Playpen, it is no longer a problem. It is suitable for parents with children at the age ranging from six months to three years. You can set up the baby pen at home or in the courtyard where you will not leave the sight of the moment to your little one while doing your own things. Made of 100% Pure PE, it is not only eco-friendly and portable, but also easy to assemble without any tools. Safety gate with Safety lock and run bear door definitely ensures baby’s security. With 14 small panels, 1 door panel and 1 big game panel, the baby playpen can be used in any shapes. The big game panel laid on the floor guarantees that babies are able to be barefoot and keep clean. If you add a slide, some toys or balls in that play area, you can create a small entertainment place at home. Both parents and children will have a great time in the play zone. 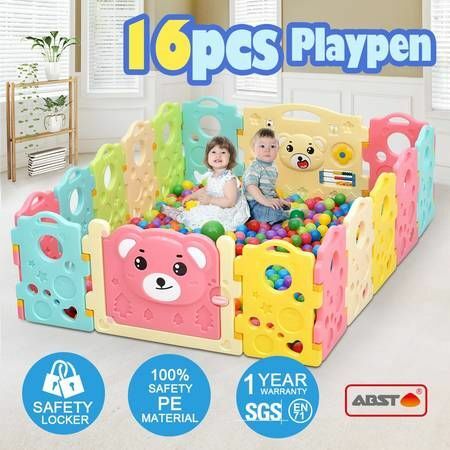 Moreover, this playpen for babies is decorated with colorful and squeezd souned run bear play game panel, helping babies to have much fun.